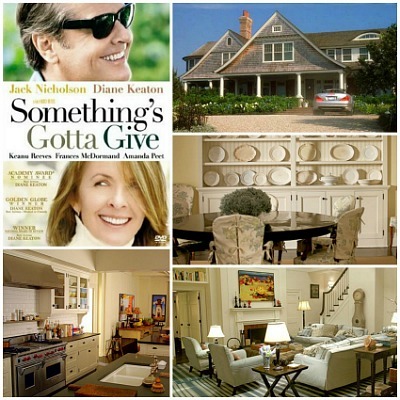 Who could forget the Spanish hacienda-style ranch that Meryl Streep owned in the romantic comedy It’s Complicated with the tile roof, the wide veranda, the beamed and vaulted ceilings in the living room, or the sumptuous kitchen? Not me! So I was excited to hear that the real house where the movie was filmed is on the market for $12 million. 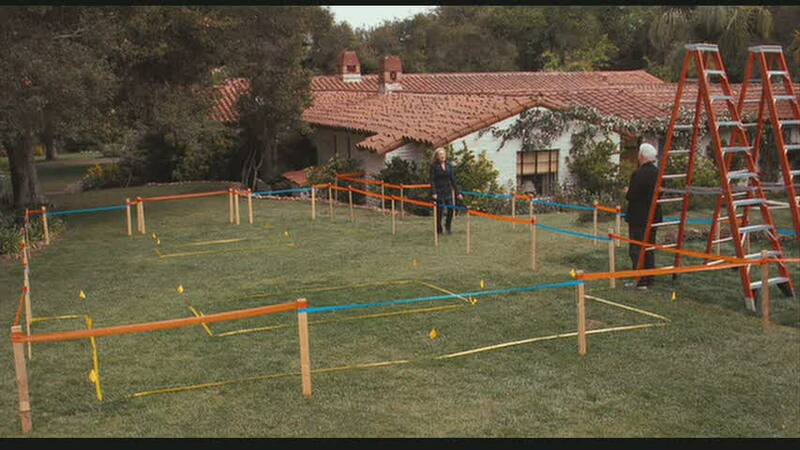 It was posing as a house in Santa Barbara in the movie, but the property is actually about an hour south of there, on an equestrian ranch with over 56 acres in Hidden Valley. 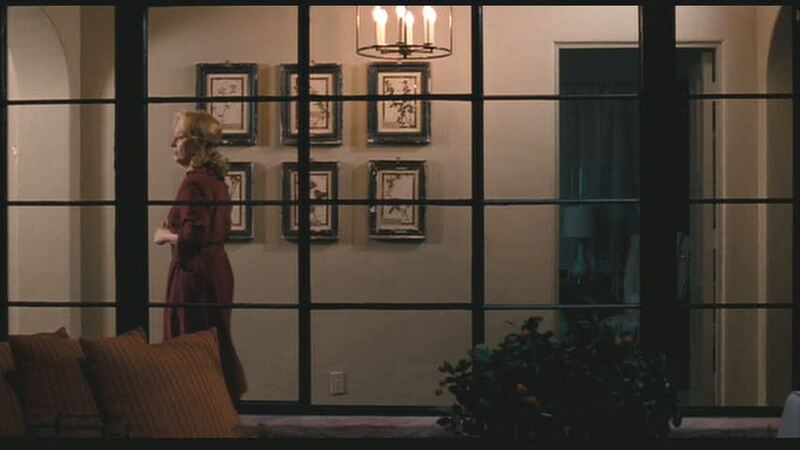 “Throughout the movie, Jane’s house is shown to be surrounded by a long, white wooden fence. That type of fence pops up quite often in film and television productions and when it does, it is pretty much a dead giveaway that filming took place somewhere on Potrero Road. The house was built in the early 1900s and has belonged to celebrities like W.C. Fields. The real house is larger than the movie version looks with over 6,000 square feet. For more photos and information, check the listing by Nicki & Karen. (Sorry, it sold!) To see more photos of how the house looked in the movie? Check out my original post about the sets, including Streep’s to-die-for bakery. Well, that was a great tour! I like both versions of the house but the movie version looks just a little cozier. It doesn’t look like much from the outside but the inside is lovely. Thanks Julia. I always wondered about that house. Even though the real kitchen isn’t as cozy as the one in the movie, did you check out the real stove!!!! Thank you so much for mentioning my blog! I appreciate it. I have mixed “feelings” about this house. 🙂 When you compare the real house with the set, it really looses its appeal, but when you look at the house itself, with its history and the respect they kept for its original architecture, then you realize how special this place really is. You might think I’m crazy, but I like the real kitchen better…it’s light and bright and I love that little breakfast nook. I didn’t know that Nancy Meyer has directed most of my favorite movie houses, I love them all but my favorites are this one and The Holiday, maybe because the stories are so good! I think the set designers did an excellent job of keeping with the feeling of the real house. I just loved that house in the movie but was disapointed to hear that all the interior shots were filmed on a soundstage thousands of miles away from California. However, I am thrilled to see that the sets strongly resemble the actual house! 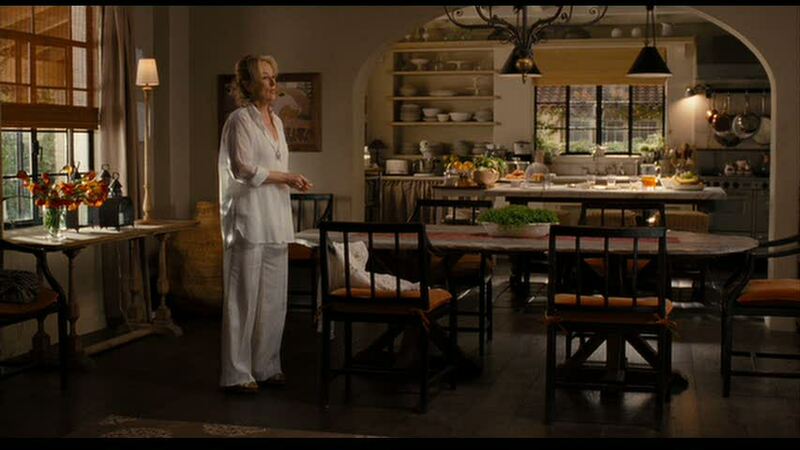 Oh, Nancy Meyers! 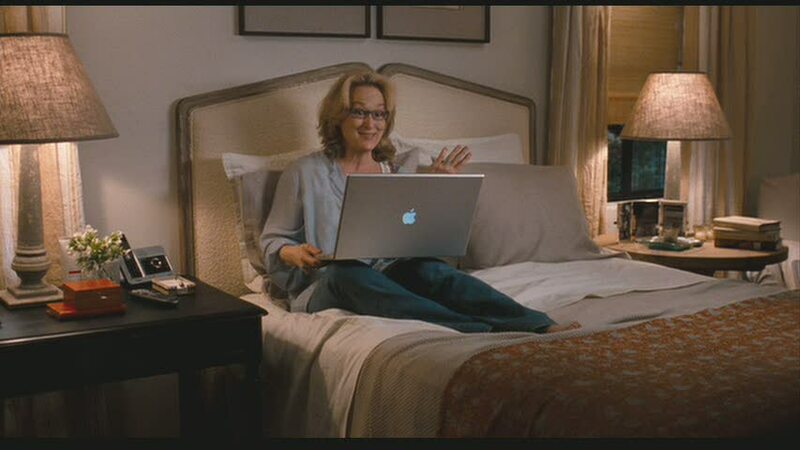 The homes in her movies just add to the charm. I always know I’m going to be inspired when I see her name attached to a film. 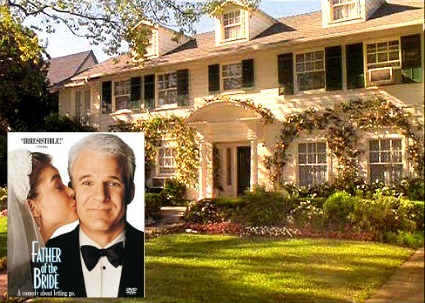 I love the movie house and not just because Steve Martin is in it, but that certainly helps! Wow! That is gorgeous. So many nooks and crannies. I love the garden and the veranda. The wicker chairs on the veranda look like the $29 ones in Ikea. Why not, I guess. I love, love, love this understated Hacienda-style home! I grew up in a brick ranch with windows exactly like these, and I would love to own one now! Sadly, too many of these are being torn down for McMansions, so I hope this home is purchased by someone who values this beautiful ranch home with it’s wide porches, courtyard, saltillo tile, and beautifully scaled rooms. I would live in this any day, and don’t even get me started on those oak trees. I like both homes in their own ways. They are both very nice. So many aspects to love about that house. Actually I am in Costa Rica as I write this. We are staying in a lovely large villa, and I totally thought of you as I compulsively opened every single door and meandered my way through. I feel like potential buyer on House Hunters International. It’s pretty fun! Ahhh, sounds wonderful to me! Good Morning Julia – I love this movie so much I only watched it las weekend and drooled as usual loved everything about the movie house and I also love the real house. If Only…. Day Dreaming Again… Dining on the veranda I’m with you.. Are there any movies coming up from the brilliant Nancy Meyers it’s been a while. Thank you for sharing this beauty with us. Regards Esther from Sydney. PS hope you have a wonderful day. I like both versions of the home too and would agree that the movie version just looks cozier. This historic hacienda really exudes “Old California”. I hope whoever purchases the home will appreciate that history as well. I grew up in California in an area that once used to be an orange grove. The original ranch home “old hacienda” still existed, although I do not know if it is there now. The ranch home was surrounded by newer “now older homes” which were custom homes, mainly constructed during the 1940’s and 50’s. I loved that old place. I also used to live in Santa Barbara too–I knew this movie home wasn’t located there either. It’s very interested how houses are portrayed in movies. 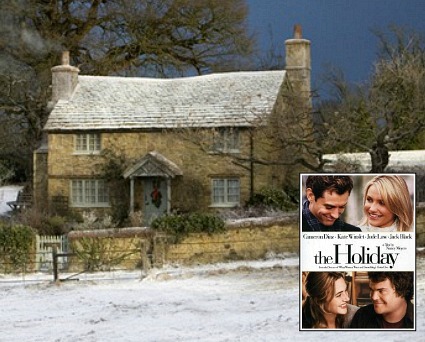 i absolutely love this movie – and this house…i think it provided the perfect backdrop for that movie to take place. it gives you such great feelings as your watching – really homey. the house almost becomes a character itself. i also loved your comments on the kitchen in the actual house – it’s a great kitchen, but it’s nothing compared to the set version! great post! il film è unico mi piace moltisssimo gli attori e la regista sono il massimo! la casa è meravigliosa ,sono rimasta delusa venendo a scoprire che “non esite” veramente sarebbe la casa dei miei sogni. 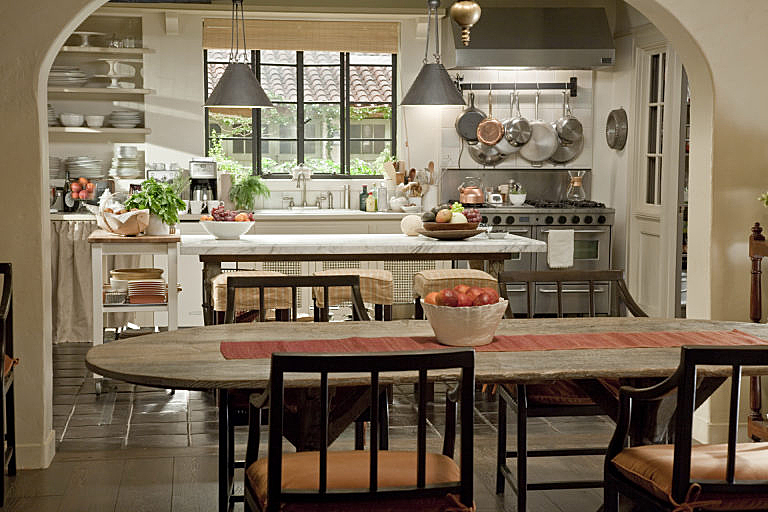 Does anyone know which tile they used in the movie in the kitchen and hallway?? Was the bakery a real place?? I love this house and I hope to copy her garden someday soon! If I remember correctly, Nancy Meyers said they built the garden just for the movie and afterwards donated all the plants to a nearby school. Julia – as always love your site. All the best to everyone this new year! Thank you for all your hard work and design love! I love all these movie and tv sets as well. You have great taste!!! I wanted to stop and give you my gratitude for compiling this site. Thanks again! And what’s the address of the house in the film?